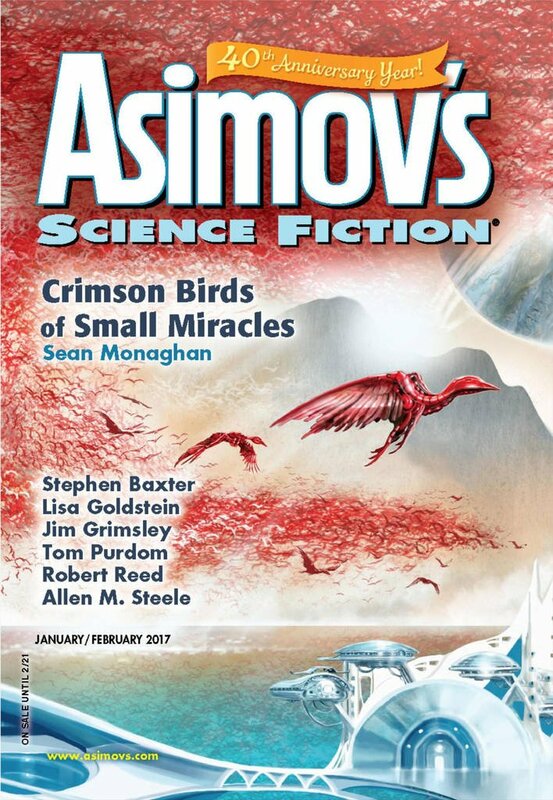 "Pieces of Ourselves," by Robert R. Chase [bio] (edited by Sheila Williams), appeared in Asimov's Science Fiction issue 01-02|17, published on December 15, 2016 by Penny Publications. Pro: At its heart, this is an exciting story, with plenty of tension and 100% bad bad guys we’re ready to see shot. The mystery of the dead officer still saving people is very cool. Con: The resolution to that mystery (she was possessed by his spirit, but scientifically somehow) is very unsatisfying. There are some writing problems that detract as well. Dialogue is uneven. There are infodumps. And in a few scenes, the author fails to control point of view. Updated the spreadsheet and regenerated the review. Thanks for the correction. Greg will report the error through the Kindle app.